Milwaukee's Burger Bar for Foodies. Combining quality grass-fed beef with premium local ingredients, Stack’d is Milwaukee’s burger bar for foodies. We are a locally owned burger bar that understands that keeping business local is vital to the community, which is why we purchase and support local ingredients and products whenever possible. At Stack’d we believe quality comes first. You’ll find us in downtown’s restored Kramer Foundry Building in the Fifth Ward. Join us for lunch, dinner or at our bar with 100+ bottle and tap selections and one of the best craft cocktail programs in Milwaukee. Because grass is what cows are meant to eat, beef from grass-fed cattle is better than beef from grain-fed cattle in a number of ways. Quite simply, less energy is put into growing grass than into growing grain. In fact, growing prairie grass has been shown to be one of the most effective ways of reducing our carbon footprint. Plain and simple, you'll taste the difference. Grass-fed beef is often described as having a more complex, nuttier flavor than grain-fed beef. Once you try it, you won't want to go back. 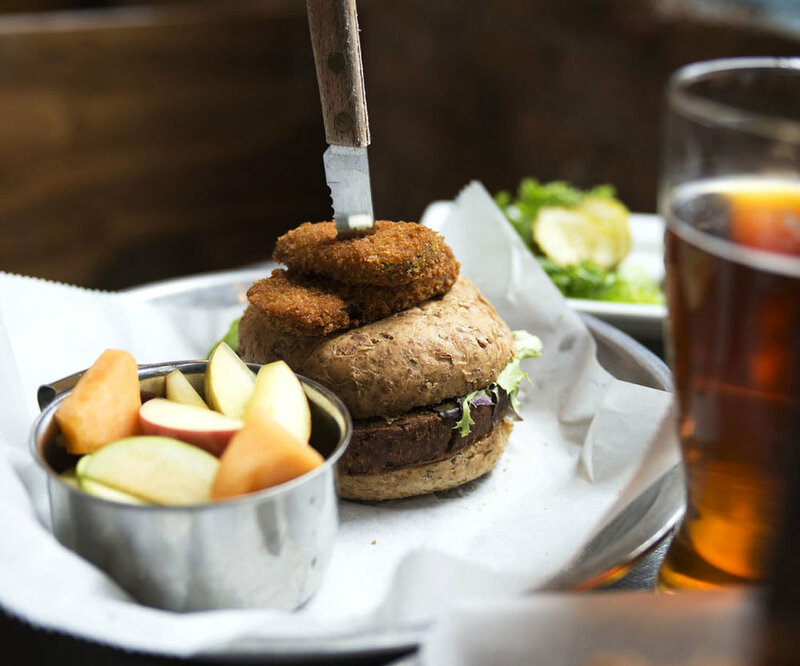 From our portabella and hummus stacks and hand-made black bean veggie burger to our bountiful salads and many of our appetizers, we're proud to offer menu items befitting of every lifestyle. From a separate gluten-free fryer to having several gluten-free beer options, gluten intolerance and wheat sensitivity are lifestyle challenges Stack’d strives to accommodate. We extensively train our staff to be knowledgeable on which items are “safe” for those that live a gluten-free lifestyle. Ask your server to make a recommendation for you if you are unsure.